This week I had the wonderful opportunity to interview London based illustrator Chrissie Abbott for the upcoming Absolut Originality Exhibition running in Dublin next week. I didn't realise that I already knew some of Chrissie's work and I can now say that I am a true fan. I am in complete awe of how talented she is. Please take a look at her site to see more of her amazing work. Have you been creative from an early age? When did you first start getting into the world of design/illustration? I think it’s just something I've always enjoyed; at school art was my favourite, the only subject I liked. I've always drawn and made things; collaging old scraps of Christmas cards, birthday cards and magazines was a group activity in my house when I was little. When did you know that you wanted to be an illustrator? What made you realise that's what you wanted to do? I never really considered another option; it just wouldn't make sense to me to not do this. The covers of book and record sleeves that my parents owned were a massive inspiration and it was just always what I saw myself doing. Do you think it's important for someone interested in design/illustration to study it in college or do you think you can be self-taught? I think it really depends on the person. The thing about Art College is that it doesn't teach you to have talent, it teaches you techniques to express what's inside of you, and you meet wonderful and inspiring people and you learn how to communicate your ideas. At the time I wasn't the biggest fan of being there but in hindsight I learnt how to work to deadlines and discovered printmaking which was invaluable. As someone who doesn't know a great deal about the world of illustrating, I would love to know who your favourite illustrators are. There are so many! Jiro Bevis, Marcus Oakley, Will Sweeny, French, Esra Roise, Jody Barton, Jim Stoten, and Peter Blake is my ultimate hero. I had a look at your tumblr and I noticed you seem to be a fan of a lot of different films, television and music. What are some of your favourite films/television/music? Do you think that they have an influence on your work? Are there any directors/musicians that you would love to work with? I love Sofia Coppola's visual style; The Virgin Suicides was a big influence and inspiration for me because it was just so dreamy. Older films and TV shows like Twin Peaks, The Holy Mountain, Harold and Maude, and Easy Rider are amongst my favourites. I really enjoy working with musicians and bands whose music I like because it’s usually really easy to translate into a record sleeve. I would flip out if I ever got to work with My Bloody Valentine or Neil Young. What makes you decide to work with a brand? If it’s an exciting project it’s great to work with brands as it elevates your work to a wider platform and gets seen by more people. Do you have a favourite from your body of work? Recently I did artwork for a band called Big Deal, and I think this is my favourite because they were such a joy to work with and I felt really inspired by their record. I have a friend who is just starting out as a fashion illustrator, is there any advice you can give her from your own experience? I think just work hard and be enthusiastic and try not to lose the love of what you do. Do you have any plans for the future? Are there any brands/people you would love to work with? I’m just about to embark on a trip to Australia and I'm excited to be in warmer climes and get inspired by new things. I'd love to do more fashion stuff like textile and pattern design. 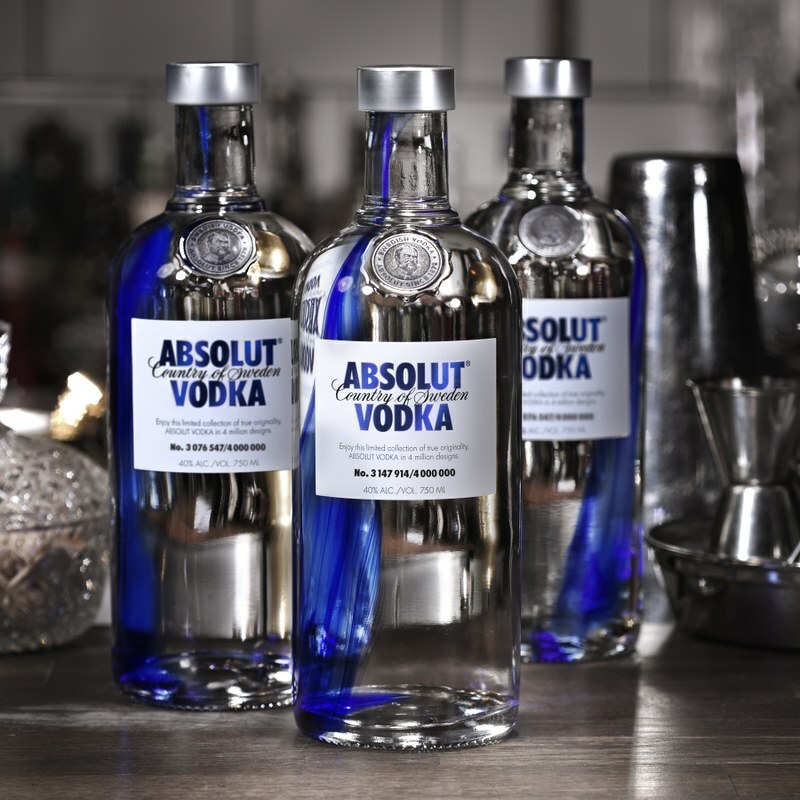 What inspired you for the collaboration with Absolut Vodka? I'm a big fan of rocks and minerals, for me the cobalt blue held a wealth of inspiration, plus I get to work with some amazingly talented and people who make wonderful things. Chrissie will be featuring her designs in ABSOLUT ORIGINALITY, a free multidisciplinary exhibition taking place in Mabos Arts Space, 8 Hanover Quay, Dublin. The exhibition is free and open to the public on Thursday, October 31st; 11am to 8pm, Friday, November 1st; 11am to 6pm and Saturday, November 2nd, 11am to 6pm. The exhibition is to launch this year’s new limited edition bottle design, ABSOLUT ORIGINALITY, which features a streak of cobalt blue to reflect the original streak in all of us. Visit www.ABSOLUTORIGINALITY.ie for more information. I hope you enjoyed reading the interview as much as I did coming up with the questions and a huge thank you so much to Chrissie for her time and to Absolut for this opportunity. Hello, dear Emma, and thank you for this interview which introduced me to the life and work of the talented Chrissie Abbott. How exciting it must be for her to be working with Absolut on the launch of its Absolut Originality campaign featuring a distinctive, limited edition blue streak bottle. I have always been interested in advertising, design and illustration and was very impressed by the samples of Chrissie's work. I was directly or indirectly associated with the advertising industry through most of my career. Beginning In the 1990s and into the new millennium, Mrs. Shady and I operated our own executive recruiting business working exclusively with ad agencies and the young copywriters, art directors, producers, designers and illustrators that formed their creative teams. One of the agencies we worked with was TBWA/Chiat/Day which at the time was Agency of Record for Absolut. We had the opportunity to examine the portfolios of hundreds of young creatives and evaluate their work. Advertising and marketing have changed dramatically since my years as a headhunter. Chrissie Abbott is part of a new breed helping to take it to the next level. I was delighted to learn that she was inspired and influenced by Sofia Coppola, The Virgin Suicides, Twin Peaks and Easy Rider - all favorites of mine. Thank you for a very interesting and informative post, dear friend Emma. I wish you a very happy Sunday and a great week ahead! I actually was just studying some Absolut advertising in my masters class. It's really interesting and artistic. Very different from other advertising. They really want to be perceived as art advocates. This was awesome to read about and see what artistic endeavors they are in to.